Donald and Malcolm Campbell – forgotten heroes? 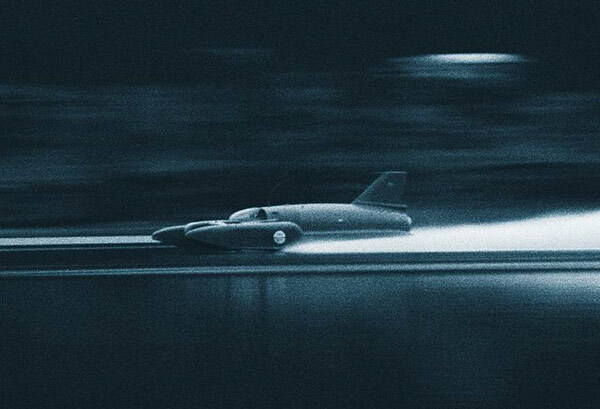 Just before 8.30am on the morning of 4th January 1967, Donald Campbell eased his Bluebird K7 boat away from the jetty on the edge of Coniston Water and headed out into the lake – in pursuit, as he had been so many times before, of a new world record for speed on water. His first run, made just after 8.45, saw Bluebird cover the measured kilometre on the lake at an average 297.6mph, though it peaked at around 315mph. Then, unaccountably, without waiting for the wake of that run to subside and the lake to return to its traditional stillness, Donald turned the boat round and began the second, opposite direction, run. Donald Campbell’s final run – 4th January 1967. At 8.48, travelling at around 290mph, Bluebird’s bow lifted out of the water and, in a scene that was to be repeatedly played out on newspaper front pages and TV newsreels for days and ultimately years afterwards, the boat performed a graceful backflip, crashing back into the lake to sink to the bottom and take Donald to his death. Visit Coniston lake today and you will find that air of stillness remains – it’s a tranquil place seemingly quite removed from the drama of 1967 and before. But Campbell reminders are everywhere, his spirit very much pervading Coniston. 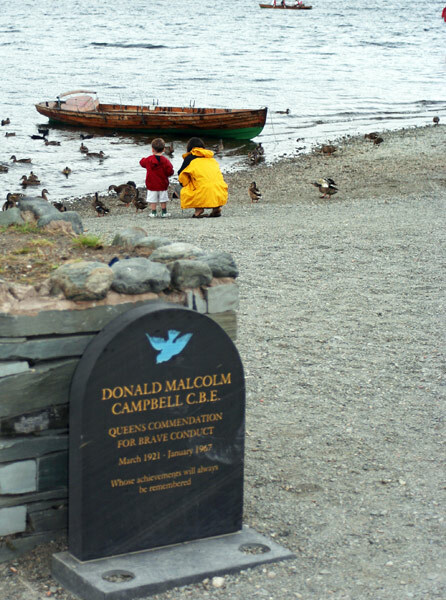 Donald Campbell’s memorial on the shore of Coniston. Eventually this museum will also house the restored Bluebird K7, salvaged from the lake in 2000, in an operation that also eventually located the body of Donald himself. Today he lies at peace in Coniston churchyard – a plot to which many fans of speed make a pilgrimage each year. Yet neither Donald Campbell, or his equally speed-record setting father, Sir Malcolm, came from the Coniston area. Both spent the vast majority of their lives in two small boroughs of East Surrey – boroughs that today barely acknowledge these two heroes ever existed. Growing up in the small town of Horley, in the shadow of Gatwick airport, I soon became aware that the Campbells were locals. My late father used to tell stories of delivering oil to Donald, while I discovered that a rambling property called Povey Cross cottage, today in increasing danger of being swallowed up by the ever-expanding airport, had been owned for many years in the 1920s by Malcolm. Here he housed his earliest Bluebirds, giants of cars that would be unloaded at Horley railway station and driven home along public roads. It was in these that he took the Land Speed Record past 300mph in 1935, following this by raising the water speed record to 141.470mph, on Coniston lake in 1939. 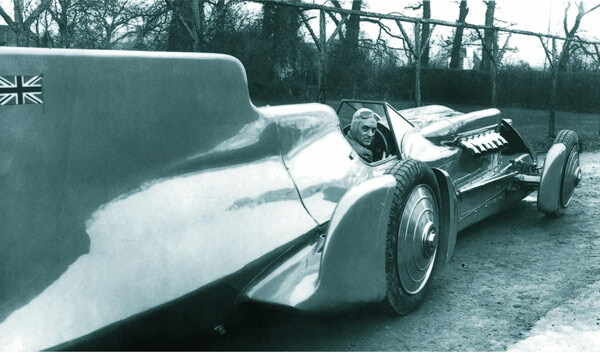 Malcolm Campbell in his LSR-setting Bluebird of 1935, probably taken at Povey Cross Cottage. Later, as a cub photographer on the local paper I went to Malcolm’s final home on Reigate Hill, a fascinating building with parts from the Mauretania liner incorporated into it – it was here that he died, after a series of strokes, on 1st January 1949. But it was only in 1998, after I was appointed editor of the Dorking & Leatherhead Advertiser newspapers and one Christmas decided to write a couple of features on the Campbells to bolster a fallow news period, that I discovered the full extent of the Campbell local legend. I learnt how Donald, much less well off than Malcolm but determined to carry on the record-breaking tradition, had rented out a garage at the Reigate Hill Hotel – today still trading as the Reigate Manor – in which he restored his father’s pre-war Bluebird K4 boat. This was something Malcolm had tried to prevent, Donald being forced to buy K4, and the Bluebird car, from the estate. It took great determination and many setbacks, but the younger Campbell finally became a record breaker in his own right in July 1955 with 202.32mph on the lake at Ullswater, not far from Coniston. Donald then turned to the Land Speed Record, building the jet-powered CN7 car. In the late 1950s when he obtained his first jet engine he reputedly strapped it to the floor of a barn at his then home of Abbotts in the village of Leigh, midway between Reigate and Dorking. The barn is still there, at the opposite end of the road in which my mother lived for nearly 30 years. 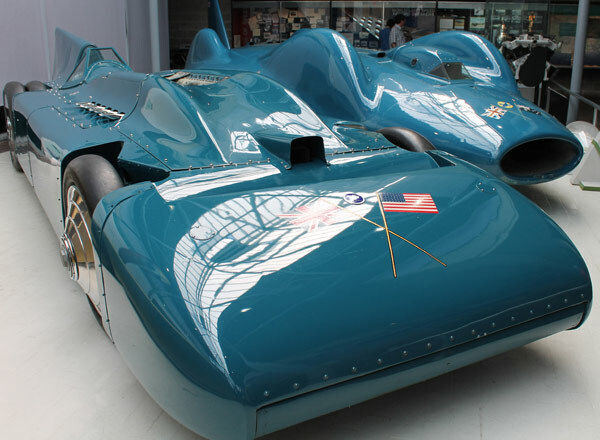 Father and son Bluebirds – the 1935 and 1964 Land Speed Record cars. As a youngster living at home, I used to drive to the pub in Horley a few times a week, passing another big house en route. Little did I know that Roundwood Hall was Donald’s home after Abbotts, and the big concrete shed that is still visible from the road today specifically built to house the Bluebird car and boat. Only his final home, Prior’s Ford in Leatherhead, where he was living at the time of his death, has fallen victim to development, today recalled in the replacement building’s name of Campbell Court. Even in death the Campbell connections with this small part of Surrey remained, particularly in the form of Leo Villa, the faithful mechanic who spent his life organising father and son’s records. After Donald’s death Leo retired to Reigate, where he took up gardening. He died in January 1979 in the same Redhill hospital where I was born 18 years earlier. When I was editing those two newspapers at the turn of the millennium, the local authority of Dorking & Leatherhead, Mole Valley District Council, was getting very interested in its heritage. Eventually we attended the unveiling of two statues to Mole Valley heroes – the composer Ralph Vaughan-Williams, and the 19th century builder Thomas Cubitt. But neither Mole Valley or neighbouring Reigate & Banstead has found any reason to commemorate the Campbells. Brooklands Museum, at the pre-war race circuit on the western edge of Surrey and where Malcolm competed in the 1920s before getting the record-breaking bug, keeps his memory alive through impeccably restored race sheds, while for Donald there is Coniston. But in the district where they lived, the only evidence of two men who set 11 world land and water speed records between them is a tiny, easily-missed display in the Leatherhead local museum. It is by no means enough. 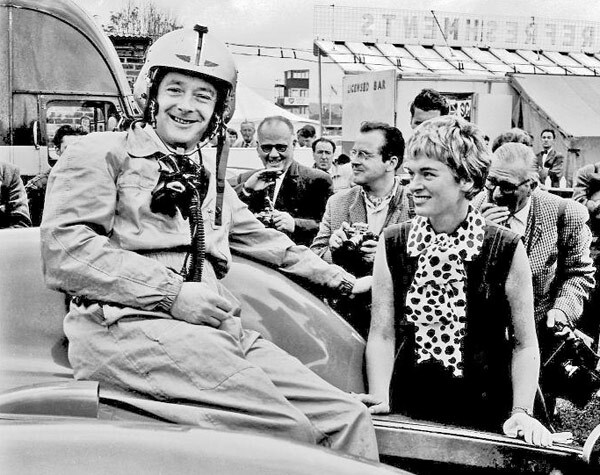 Donald Campbell with his wife Tonia at Goodwood in the 1960s – still a speed king today. So why raise this now? Well 1964, 50 years ago, was a special year for Donald Campbell. On 17th July on salt beds in Australia, he drove Bluebird KN7 to 403.1mph and finally secured an officially-recognised Land Speed Record, in the eyes of many exercising fatherly demons that had haunted him for years. Then on 31st December he raised the Water Speed Record to 276.33mph.